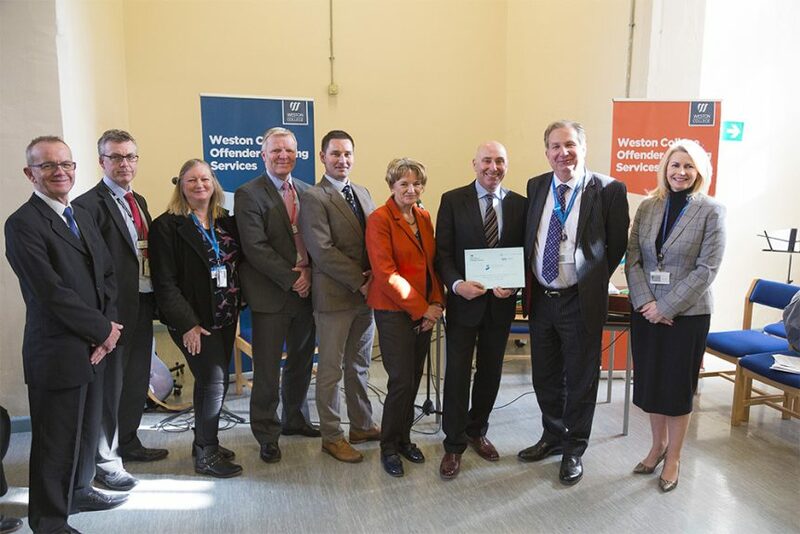 Weston College has received the Association of Colleges’ Beacon Award for Widening Participation in Learning, sponsored by Gateway Qualifications, at a ceremony in HMYOI Portland. Guests were welcomed by Dr Paul Phillips CBE, Principal and Chief Executive of the Weston College Group and Steve Hodson, Governor, HMYOI Portland. The Beacon Award for Widening Participation in Education is open to all colleges of further education and sixth form colleges which have made specific provision to attract those from under-represented groups to engage and succeed in learning. Carol Stott, Chair of the Association of Colleges Board, who spoke at the ceremony, praised the College for their work in offender and detainee learning provision: “This award was given in recognition of effective and imaginative approaches to attract and motivate learners with impressive results in successful acquisition of skills, knowledge and qualifications. Guests at the ceremony had the opportunity to tour the educational facilities and enjoyed a creative arts performance by learners, including their own poetry and self-composed songs. Dr Paul Phillips CBE, Principal and Chief Executive of the Weston College Group, commended his staff and said: “This award shows that Weston College is leading the field when it comes to providing effective opportunities for some of the most disenfranchised learners in the country. Our Beacon Awards success confirms the innovative and student-centred practice that permeates the whole of the Weston College Group. “When it comes to offender and detainee learning, we provide the same award-winning level of teaching and support that we offer students across the College. Our approach is to put our learners first and to enable them to realise their full potential. This latest award follows national recognition of the College’s offender and detainee learning provision through successful inspections from Ofsted and Her Majesty’s Inspectorate for Prisons. In 2015, offender learning lecturer Jerry Nightingale became the first prison lecturer to be named Further Education Lecturer of the Year at the Pearson Teaching Awards for ‘Britain’s classroom heroes’.